Voyou means rascal or criminal in French. Top notes of bergamot, coriander, and pink pepper give an initial energetic blast on first spray. Le Voyou was inspired by Arsene Lupin, a fictional character from detective novels written by French writer Maurice Leblanc. 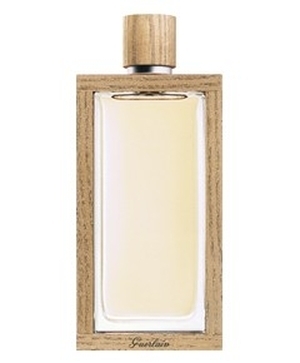 Warm sandalwood anchors the fragrance as notes of light patchouli and cardamom develop. Wears a little more subtle than its brother fragrance, Le Dandy. A light skin scent that makes a nice transition from day to evening. The unique wood-framed bottle looks like a piece of modern art. Summary: Le Voyou is subtle yet strong. It doesn’t project like a powerhouse, but it definitely takes you on a nice journey as it stays close to the skin. When wearing it, I will forget about it, breathe in and enjoy a fresh whiff. Though Voyou is available from Neiman Marcus, I would recommend that you contact Guerlain Boutique in Las Vegas as their customer service is beyond impeccable, and they carry a complete line of all Guerlain fragrances.